Ever got frustrated by weak mobile signals in your house or workplace? Us too. Now Vodafone has a plug-in router-alike solution – the Vodafone Sure Signal - that means you won't ever again have to crane your head out of a top floor window to get decent in-home coverage. 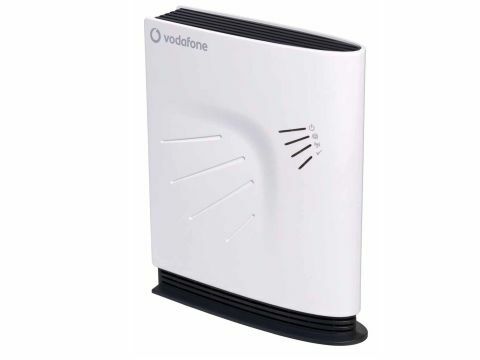 The Vodafone Sure Signal is effectively a 3G mobile phone signal booster that you plug in to your existing broadband connection – like having a mini cellular base station in your own home or office. If you're thinking "that looks like the Vodafone Access Gateway" then you'd be right - the box has been renamed. Vodafone says it made the decision after customer feedback. Once connected to your router, you can make calls or use data services with your 3G phone with a full-strength signal. It won't matter what network coverage is like around your home location. It'll all be routed through your internet connection. The Vodafone Sure Signal is a small wedge-shaped box, approximately the size of a fixed line broadband router (it measures 190(h) x 150(w) x 37(h)mm and weighs 414g). Made by French telecoms manufacturer Sagem, the Sure Signal is a 'femtocell', which provides low-powered cellular connection in-building, linking the phone to the mobile network via a home broadband connection rather than via normal network cellular base stations. Up to four Vodafone 3G handsets can make or take calls, or use data services, through the Sure Signal at any one time, and any 3G mobile phone in the UK is compatible with it. As well as mobile phones, other devices such as USB modem sticks and data cards can be registered for access to the Sure Signal. The list of registered numbers can be added to or changed with a quick call to the support line. Vodafone has launched the Vodafone Sure Signal primarily as a device for boosting signals for the home or small business where signal strength is an issue. It is selling the device on its own for a one-off fee of £160, or it can be had from free bundled with certain 3G handsets for a contract payment of £15 per month. Alternatively, existing Vodafone customers can get one for an additional monthly charge of £5.